When someone makes a purchase online they are expecting to pay – but early Cremation Arrangement Websites were just emulating the in-person arrangement of Stats > Services > Forms > Payment. We changed that – and our clients loved it. 15:10 Need help on your cremation website? Brian Young: [00:26] Welcome to another episode of “The Strategy Talks” by Funeral Results Marketing. On today’s show, we’ll be talking about online payments and in particular, getting the money first. Rob, can you go into some more detail about this? Robin: [00:41] Sure, Brian. Let’s look back at funeral directors and our issues with asking for money. Most funeral directors have this adverse relationship with money. It’s the one thing that we don’t want to talk about. I know from being a funeral director starting 30 years ago, and when it came to you’re making the arrangements it would be the last thing that you talk about. [01:11] I can remember Tony McCall, who he was a second generation owner at McCall Bros. who I was working and he’s since passed. I remember him tell me, “Rob, there’s all those paperwork now, and it used to just be a handshake and they will just bring in the money. We won’t even have to ask for it.” Things sure have changed over time. [01:37] Those things are getting better, especially over the last 10 to 20 years. It’s improved when we were told to start getting payment either up front or a partial payment. Again, it was new to us. Sure the owners understood why it was important for the cash flow. We’ll talk about that a little bit more. [02:02] For the staff, it was just something uncomfortable for us. I remember when we were being coached on asking for at least getting the cash event is paid for in advance, or 50 percent down, or if at all possible getting full payment. [02:54] It was uncomfortable for us in the beginning, but funerals have slowly improved in this manner. It makes sense because margins are smaller and cash flow is more important now. [03:13] At first, my first part of entrepreneurship was that basically being a pre‑need rep. David McCall allowed me to run the premier division of McCall Bros. as my own business. I found out how important getting the cash was. If there is no payment with a pre‑need contract, there was no money for Rob. [03:59] I’m sure for the pre‑need people out there they probably think, “Hey, I do that in one transaction now.” The way it was then we were only allowed to make a $200 per contract maximum. I believe I had six or seven signed contracts in that day, but just really hassling and got the final check. [04:25] I was so excited that I remember calling Dave with the good news. This was probably about 20 years ago. As we progressed when I started my own marketing agency, it was the same thing. I didn’t get paid personally if the client didn’t pay for the services. [04:48] At one time it used to be hard to ask for the credit card. Now, not so much. No, don’t get me wrong, I’m not all about the money. It helps the consumer as well, because if the payment isn’t made then it just prolongs the process and prolongs the result that we’re able to provide them. [05:13] One of the things that I was taught when you get down to the payment question is ‑‑ this is just only aside for the funeral directors listening and it’s about the total for the funeral ‑‑ is going to be $8,550. How do you like to look after that today? You would just keep your mouth shut and sometimes it was uncomfortable. [06:06] Before it was always like, “Oh, we could send you the bill in a couple of weeks.” That would be just not be good for cash flow. [06:14] As e‑commerce which is paying for goods and services online has continued to increase. I’ve been a real student of the whole e‑commerce process, both for offering our own services and memberships, but also how it applies to funeral homes. I’m always watching and trying to connect the dots of how does this pertain to funeral homes and cremation businesses. [06:40] When I noticed other e‑commerce commission websites, it was like they slipped back to that adverse relationship that the funeral directors had where they put them getting the money plussed in the process. [06:55] On the other hand, for all of these e‑commerce conferences that I had attended and courses that I was taking just to really understand the process, the main thing was removing the friction points. Removing all the obstacles that were in the way of getting the person to make the transaction. [07:18] When we do the traditional way of having them add all their vital stats first, and then getting them to fill the forms they were probably putting 80 to 100 small friction points in‑between them. [07:33] Sure, they would know most the information for what we need for the death certificates and commission authorization forms, but there could be one or two little questions that maybe they need to ask someone else, or to consult with someone, or look up some information. [07:50] If that’s the case, maybe they were ready to make the payment. Now, that’s blindsided them and maybe they’ll abandon the process and dig that up. You just have to hope that they come back. [08:06] I decided to flip the process. Get the money first, stats second, and then get the forms completed third. As I say to my clients, I’m guessing you’d rather get your money first and chase the client around for some stats information, than to have all the stats information and try to track the family down to get a payment and all our clients agree. [08:31] Taking that note just one step further, I just returned from ICCFA in Nashville, where I attended Paul master’s presentation called i‑cremation. Paul was going through the mechanics of online arrangements and completing arrangements online. Brian: [09:17] What kind of applications do you see this having? How do we put this to the action? Robin: [09:22] Sure, Brian. The cremation arrangement process is just one of them. We’ve had a couple of clients actually want that reversed for some reason. They want that or maybe their state or region has some particular regulations about that. We can accommodate that for sure, but if for the best case scenario you’d want to get that first. [09:53] You can also apply this to just even to the funeral home setting. It doesn’t have to be the online cremation arrangement. 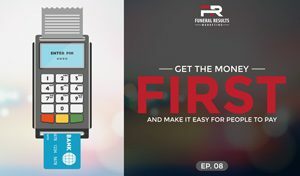 We’ve created what we call payment centers on the funeral home websites where the funeral homes can receive payments for maybe services or extra death certificates. Other incidentals like additional flowers, or obituary notice, whatever it may be. [10:23] The nice thing about this is that by having this capacity on their website, having an e‑commerce system on their website they can sell urns and jewelry. We have some clients that even sell caskets. It takes that brick and mortar business even though it’s traditional for the people. [10:43] The stats that I saw from emarketer.com, they really track this. In 2016, they’re saying that out of all retail transactions, over eight percent of them are online. [11:00] Even if maybe funeral doesn’t totally fit into all that, even half of that, even four or five percent, that’s still an opportunity to serve that group of your community. That’s only going to start to increase. [11:22] Also by having a shopping cart on your website, you can also start to take funds directly for charitable donations. Even we’ve been creating a little module where funeral homes could set up like a GoFundMe style contribution, where the community can put money towards the individual’s funeral. [11:48] Even though this sound like separate applications, they all filter into the shopping cart process where there’s the secure transaction made on the funeral home’s website, then it goes through a gateway which is the secured transmission to the merchant account. [12:10] There’s three parts to that scenario. The shopping cart, the gateway so the secure transmission of the information, and the merchant account. Now, it’s becoming easier to use and get it set up. [12:28] Currently, we’re recommending our customers use Stripe, you can find more information at stripe.com. They charge 2.9 percent per transaction, plus there’s a 30‑cent charge. That’s mainly for people who are using small little transactions like eBay style transactions. [12:49] The nice thing about Stripe is compared to PayPal, PayPal has a similar payment set up, but PayPal charges $25 to 35 a month. There’s no monthly fee for Stripe and the application process is quite a bit easier with Stripe as well. [13:08] The nice thing too is that the funds go from your shopping cart through the gateway to the merchant account which here will be Stripe. Then in two days, that money will be transferred into your bank account, to the funeral home’s bank account. It just makes it a lot easier and more and more clients are finding that it’s just very convenient to get people to pay. [13:38] Again, as we talked in the beginning cash flow is so important to businesses nowadays, and if you’re always having to wait for people to either come by, or drop off a check. Now you can just say, if you want you can just go to our website, scroll to the bottom of the home page you’ll see a little link there called payment center. Click on that link. [13:59] Some clients have asked, “Will this keep walking them through the process?” You’ll see there’s the box there, entering this amount and they’ll read out the amount and check off services. Then just fill in the deceased first name and last name. Now, you’ll go to the checkout, click the button and [laughs] walk them through and there it’s done. [14:24] It’s done with high‑security. Obviously, all of our websites have what we call SSL certification. The transactions are secure. Also using Stripe or the other payment gateways are secure as well. [14:41] That’s getting paid, getting paid first, and how e‑commerce is changing for funeral service. That’s what I wanted to share today, Brian. Brian: [14:54] That is really interesting, Rob, and something that too many people overlook, especially as consumers get ever more online‑focused and ever more used to buying things online. [15:06] With that I’ll just say to our listeners that if you need more help, or if you’re interested in cremation arrangement website, or even a human funeral website that has your own payment center or online store you get all the profit. [15:19] Please feel free to give us a call, or you can send me an email directly at brian@funeralresults.com. I can help you with that or for some reason it’s a complicated question or rather a remarking twist, Rob will jump in on that. [15:33] We’ve enjoyed having you on this call today. Rob, you’re going to tell us about what’s new here at FRM. Robin: [15:39] Yeah, you bet, Brian. Things are coming along and we got a couple of things to talk about today. We’ve just launched another cremation arrangement website. It’s called TristarCremation.com. It’s owned by Jeff Murphy from Nashville. [15:56] If you’ve been following along maybe on our website you’ve seen Jeff’s testimonial how we created the NashvilleCremationCenter.com website for Jeff a couple of years ago. His first year did 211 calls. In the second year, had over 350, I believe. Brian: [16:13] 368, wasn’t it? Robin: [16:19] Yeah, actually that’s right. [laughs] Yeah, 368. Right now they’re over 600. It’s coming along great for them and he has focused on the Nashville Center. One or two branched out beyond that. [16:38] He’s not tackling the whole state, but the Tennessee flag has three stars on it. You can’t believe when we do our little brainstorming session of naming. I know Brian, in upcoming episode we’ll be talking about naming and cremation societies or not have cremation society. [17:22] We looked and it was available. That’s change in our lives so we’re looking for big things from that as well. You can check that out at TristarCremation.com. [17:33] We may have been Brian [laughs] we’ve been solidifying some more details of our event CremationConference.com. This is going to be held in St. Petersburg, Florida in mid‑September. [17:50] We’ve confirmed our guest speaker John McQueen from Anderson‑McQueen Funeral Homes in St. Pete. We’re going to have a tour of his facilities as well during that. Both on the website side and also the conference coming up. [18:09] One last thing, if you haven’t had a chance we do have the recording of our Google AdWords webinar that we recently did. That’s on the website as well. [18:18] You can just go to FuneralResultsMarketing.com. Go to the navigation learn and then you can click on the webinar and you can get immediate access to it and some of the worksheets and just to take a look at your Google AdWords. [18:36] I’ll pass it back to you, Brian. Brian: [18:40] I’m really looking forward to that conference, Rob. I think it’s going to offer a depth and a breadth of information that this industry is just not seen before. [18:48] Like you mentioned there, the Anderson‑McQueen story add such context because that firm has already been through the cremation revolution, you could say. They went from about 20 percent cremation like 25 years ago now or so, to close to 70. They’re in Florida. [19:08] Hearing their story and the brands they launched to deal with that will certainly help the attendees to better understand how to position both cremation brands and funeral homes for success. That is going to be valuable. [19:19] Along with that, I’ll go ahead and share with you that we’re always interested in your burning questions about online marketing whether it’s for funeral home or for cremation business. [19:30] Again, we’ll just ask you please go ahead and leave that here and we will try to answer it in an upcoming episode. If you like what you’re hearing, please leave a comment on the blog or give it a rating on iTunes or Google Play. [19:42] It’s always a joy having you here with us and we hope there’s a lot you’re learning. We get a lot out it and we think it helps us stay sharp so we can give you better service. With that I’ll turn it over back to you, Rob. Robin: [19:53] Thanks, Brian. Thank you to you for spending this time with us today. Our goal for you is to serve more families and provide them more meaningful services. Make sure you check back soon for another episode of Strategy Talks by Funeral Results Marketing. [20:07] Until the next episode, this has been Brian Young and Robin Heppell.